Tony Romo’s so hot right now. He pretty much stole the show in a wildly entertaining AFC championship game by correctly predicting several plays on air in key late moments. Now, with Romo preparing for his first Super Bowl as a CBS analyst, Awful Announcing caught up with the former Dallas Cowboys quarterback in Atlanta. How many times this week have you been asked about your play prediction skills? Over 1,000? Yeah the week so far has been about asking about outcomes. But I can’t see any formations, so I can’t tell you [much]. Has anyone complained that you’re spoiling plays? Not much. I don’t think I’m really doing it that much. I brought out a little bit of the communicating before the play last week. I had toned it down a little bit this year, but I brought it back out for whatever reason. You consciously toned it down earlier in the year? Well, I feel like you don’t want to do the same thing over and over again — whatever that is. Just to make it more enjoyable. You sprinkle stuff in and try to use your knowledge. How do your nerves for this game compared to those you experienced before big games when you played? I think you’re a little nervous for everything you do. But like anything, the more prepared, the more years under your belt, the calmer you’ll be. But you’ll settle in and have fun and call a game. Would you feel differently about calling this game if the Cowboys were in it? Nah, I think you’d be excited no matter who’s playing in this game. For me, I have a job to do, so it’s not like you’re gonna change what you do. But I played for the Cowboys, so you’re always wanting them to do well. Do you watch broadcasts back and critique yourself? Yeah, you’re always trying to learn and get better. It’s just like any job. You have good moments and not as good [moments] and you try to improve. There’s a Super Bowl prop bet that asks if the broadcast will mention Sean McVay’s age over or under 1.5 times. Do you want to do America a favor and guarantee that you’ll mention his age at least twice? On if he figured he’d become a broadcaster during his playing days: I really didn’t know what I was gonna do. That was just one of a couple of choices I felt like was a possibility. On his success as an analyst the last two years: You try to do the best you can and make it fun, and hopefully people at home enjoy it. If you learn something, I feel like that’s always more fun to watch. If you can add humor or make it enjoyable and not boring, [because] it’s hard to sit down and watch anything for three hours anymore. Everyone’s playing on their own — my wife’s on Pinterest or something half the time. So I just know human beings — if they’re not being entertained in some capacity or learning, I think it’s hard to keep their attention. If it’s their favorite time, they win. But if it’s not your favorite team you’re in and out. So I just want to make people enjoy it. 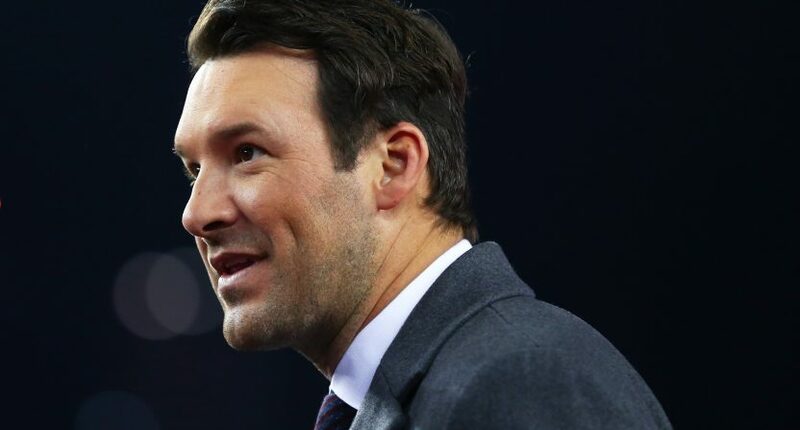 Tony Romo joking on prospects of working for the Weather Network: "Yeah I think they pay more so I'm considering it." On the difference between broadcasting and quarterbacking: The difference is as a broadcaster you have free reign. As a broadcaster you can [take] everything that your brain sees and go communicate. On the football field you’re resigned to a structure or plan, if that makes sense. You don’t have control over that. So you’re the head coach and quarterback when you’re a broadcaster. You’re freed up.